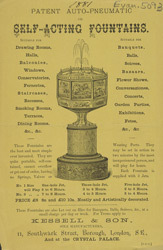 This is an advertisement for an ornamental fountain manufactured by Kessell and Son. One of the most significant features of the 19th century was the rise in the middle classes. They had small businesses, small families and for the first time a disposable income. They wanted to demonstrate their positions in society and one way of doing this was to purchase gadgets and extravagant ornaments with which to decorate their homes. This leaflet is advertising a 'self acting fountain', owning one of these would have demonstrated that one had a constant water supply inside the house and that they could afford to be frivolous with it.